Family History is big business these days, there are a plethora of magazines, websites, blogs and books on the subject. With the age of the Internet it is now easier than ever to type a name into a search engine and find someone. It isn’t as easy as the advertisements would have you believe but it’s still a lot easier than having to visit libraries, cemeteries and family history centres. The question I ask today is ‘Why is it so popular and why do you look back?’ What is it you’re hoping to find? I began with a desire to find out all I could about my mother’s family. At best there were two things that I really wanted: one was to find a photograph of my grandmother, the other to find the name of my grandfather. For others it may be to go back as far as you can in your family tree. For others to find someone interesting, a gripping story perhaps. Or to find living family members you knew nothing about. Looking at my family history I realise how much I have gained from looking back. Some of the things have surprised me, some have astounded me and others have taken my breath away. There are so many reasons for looking back, and I feel the need to revisit my own motivation for beginning this search. I’ve been lucky enough to find photographs, to trace a gripping story and to find living family members who have proved delightful and an asset to my life, the only thing eluding me is to find the name of my grandfather. I was so delighted to receive images of my grandmother, and am still happily digging around to try to find the name of my grandfather. The photographs came from my mother’s cousin’s son, and that is another story. Looking as far back as possible isn’t something that personally interests me, although I can understand why it appeals to a lot of people. I think it’s because I prefer to find out more about individuals than just names and dates. I am a writer of stories, not a lister of numbers, therefore a name and a date mean little to me. Having said that, it is possible to find out a lot about someone from their name and dates. You can see what was going on in the world at the time they were born and died, this gives you a picture of what life might have been like for them. You can see if their name was a popular one at the time. Finding living members of my family was not something that really occurred to me when I began searching but it has become a real joy as members of the family have read my blog or seen my ancestry tree and contacted me. 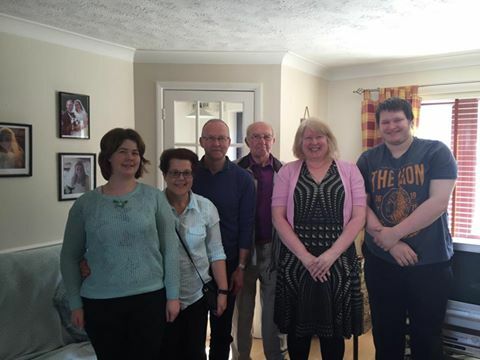 Below is a photo from May 2015 when Mum’s cousin Ron, his son and family visited me. I also wonder ‘What have I gained from looking back?’ and this is a question that requires a lot of thought. I will answer this question in the next blog. If you have any thoughts about this subject please leave a comment and I will get back to you. This entry was posted in Enid May Howells, Gordon Charles Dinnis, Queenie Cockett and tagged Adoption, Family History, family history centres, family members, grandfather, looking back. Bookmark the permalink. 4 Responses to Why do you look back? I have gained a much closer relationship with a wonderful cousin who I love dearly, as we work together tracing our joint family history. You have provided me with lots of information and I have been able to share many old family photos with you. I look forward to hearing more about our cousins and family in America. See you soon Jackie, and carry on with your blogs. I love reading them. My grandma shared so many of the stories of her childhood but they were incomplete with secrets and half whispered rumours, and I love a good mystery, my dad side was complete silence and things never spoken about, my gran on that side died when I was still a baby and I wanted to know where we came from especially the Irish surname which was all the knowledge I inherited there. My dad was terrified I would discover a dark secret and even tried to talk me out of it all I discovered was a tragedy which left a widow with a house full of children and no support.